A sound wage policy addresses itself to questions such as adequacy of wages, fairness and equity, hard working conditions and efforts, compensation against inflation, and additional commitment of employees as he grows up to rear family, etc. There are two dimensions- internal and external. Internal dimensions involves capacity to pay, work content and context, wages sufficient to meet basic needs of food, shelter and security and social commitment and like. Subsistence theory. David Ricardo develops it. It says that workers are paid to enable them to subsist and perpetuate the race without increase or diminution. Low wage lead to decrease of labor due to death and malnutrition, while higher wages increase their number due to better health, long life and more marriage. Wage fund theory. Adam Smith developed it. Wage level is a function of surplus fund available with the employer. Higher the fund, higher the wage. Focus is on employer and his capacity to pay. Surplus value theory. Karl Marx developed it. Here labor is viewed as a commodity for trade. Labor adds value to the product. The employer did not pay the full amount so collected from the customer and instead only a part is paid to them as wage, retaining the remaining by the employer. Residual claimant theory. According to this theory four factors add value to the product, which is manufactured. These are land, labor, capital and entrepreneurship. The revenue earned by selling product was first distributed among the three factors as compensation against their contribution. Whatever remained was paid to labor as wage against their value addition. Thus labor is considered as a residual claimant. Marginal productivity theory. 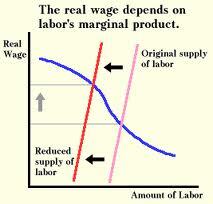 Here demand and supply of labor in the labor market determine wages. Accordingly workers are paid what they are economically worth as assessed by the employer. Marginal concept says that employer continues to employ labor as long as value addition by the marginal worker is more than his cost. Bargaining theory. Here wages level is determined by bargaining power of employers and their association Vs employees and their trade unions. Behavioral theory. Norms, traditions, customs, good will and social pressure influence wage structure. Wages are best motivators of workers. Wage must satisfy a number of needs as identified by Maslow and others like physiological, security, food and shelter, etc. Define Cash Credit and it’s Process?